Fun fact: the first article to appear online proclaiming that “infographics are dead” appeared in 2011. Yet, here we are. Internally, you can learn a ton by cross-referencing this sort of data (or data from any key publication clients or stakeholders have tasked you with) with your own data highlighting where you’re seeing most of your successes and identifying which formats and topics are your strengths or weaknesses. You can quickly then measure up against those key target publications and know if your strongest format/topic is one they favor most, or if you might need to rethink a particular process to get featured. However, there’s a key unknown here. Is the post-2014/15 drop-off due to lack of outreach? Is it a case of content creators simply deciding infographics were no longer the preferred format to cover topics and build links for clients, as they were a few years ago? There we have it. 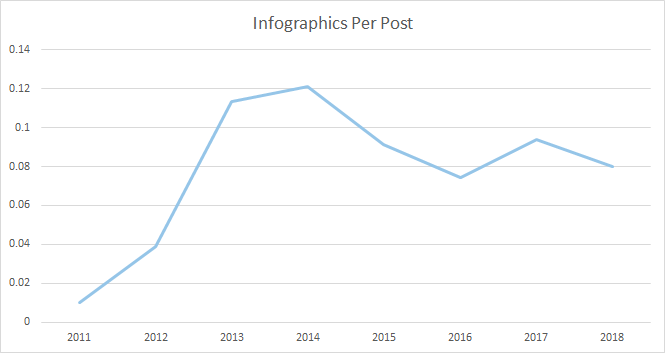 The golden years of infographics were certainly 2013 and 2014, but they’ve been riding a wave of consistency since 2015, comprising a higher percentage of overall articles that link builders would have only dreamed of in 2012, when they were way more in fashion. This is pretty surprising stuff in an age where we’re obsessed with interactives and “hero” pieces for link building campaigns. 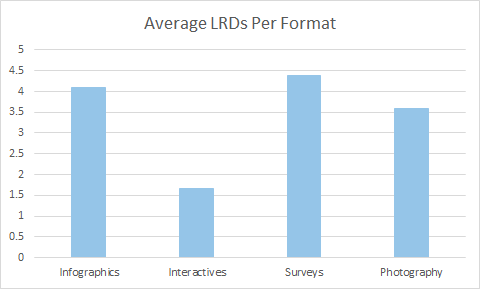 Surveys are one of the “smaller” creative campaigns I’ve offered in my career. It’s a format I’m gravitating more towards because of their speed and potential for headlines. Critically, they’re also cheaper to produce, both in terms of research and production, allowing me to not only create more of them per campaign, but also target news-jacking topics and build links more quickly compared to other production-heavy pieces. Unfortunately, I wasn’t able to extract a comment count or number of social shares per post, which I thought would be an interesting insight to review engagement, so I focused on linking root domains to discover if there is any difference in a publisher’s ability to build links based on the formats they cover, and if that could lead to an increase in link equity coming our way. Using these formats to pitch with not only increases the chances that a publisher’s post will rank more competitively in your content’s topic area (and put your brand at the center of the conversation), it’s also important for your link building activity because it highlights the potential link equity flowing to your features and, therefore, how much ends up on your domain.